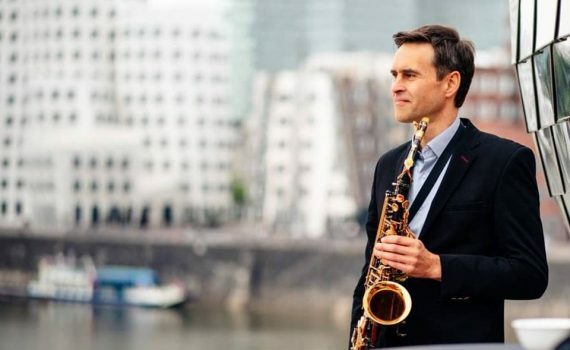 After years of world travels playing every kind of jazz (hard bop, “cool jazz,” jazz-rock, Latin), Konstantin Klashtorni launched his solo recording career as a saxophonist in the early 2000s with a Dave Koz/Steve Cole influenced vibe. Though he released two well received albums (Downtown, Led by You), the multi-talented Ukraine-born artist found himself restless limiting himself to a singular identifiable sound. He began thinking more expansively, figuring out ways to combine his skills on sax, guitar and piano with his ample composing and producing talents. His passion for the powerhouse, multi-faceted productions of Brian Culbertson and Paul Hardcastle sparked an interest in exploring new approaches to recording. Moving from Holland to a small town outside Dusseldorf, Germany in 2009, he began building a home studio – which has over the past decade been the creative launching pad for four extraordinary series of smooth/urban jazz, chillout and electronica based recordings. The latest collection (#6) in Konstantin’s Groove Jazz N Chill Series, recorded under the moniker Chillaxing Jazz KolleKtion, feels like a soothing immersion into a musical mineral bath – a truly relaxing yet still sensual and romantic jaunt into the chill side of smooth urban jazz. The focal single is the soulful, seductive “Dearest,” which begins with trippy sound effects (including a soothing, glistening water element) as part of a dreamy atmosphere. Then the groove kicks in, and we’re on our way to a magical three and a half minute world of chillaxation, aiming our positive thoughts high on the wings of a dreamy trumpet melody over the hypnotic melodic flow. Konstantin artfully weaves in other melodic instruments like a whimsical soaring flute and a bright acoustic guitar, for a multi-dimensional experience. That track is an open door to a dynamic experience that finds Konstantin varying his lead melodic voices. The journey includes the cool, swirling duality of guitar and sax on the shimmer of “A New Day,” the passionate and soulful, sax driven “All The Way,” the trippy light funk/soaring atmosphere duality of “An Evening’s Tale” and a trip to “Far Above The Moon,” where acoustic guitar and alto sax dance over a shuffling groove. Another highlight which shines a light on Konstantin’s overall sense of romance is “Love at Midnight,” which finds late night magic in the alternate embrace of a powerful sax melody and crisp guitar.